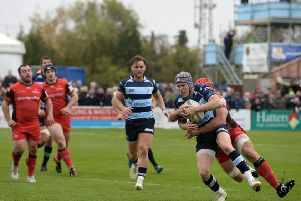 Championship rugby returns to Goldington Road this weekend as Bedford Blues prepare to take on last season’s beaten finalists Doncaster Knights. Bedford started the week nine points behind this weekend’s opponents in the league table, but with the expulsion of London Welsh from the Championship and all results against the Exiles being expunged, the Blues are now 14 points off the Knights. Following last weekend’s British and Irish Cup encounter against the Dragons Select XV, Bedford make several changes with George Perkins starting at fullback and Ollie Dodge getting the nod at inside centre. Hayden Thompson-Stringer and Ben Cooper will be propping while Will Carrick-Smith starts in the second row and Justin Blanchet gets the number six shirt.